Marsh provides a complete range of Traceable On-Site Calibration Services to meet individual Customer and Industry Specific requirements. On-Site Calibrations performed by skilled Marsh Technicians are traceable to National Standards, complete with calibration reports & calibration stickers. Documents and procedures have been approved to meet the most stringent QA and Industrial requirements. Our technicians receive ongoing safety and technical training to ensure Reliability and Value to our customers. 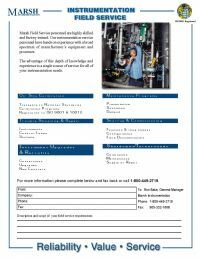 Marsh provides cost effective highly specialized solutions to all your pressure, temperature, level and flow instrumentation and controls including Recorders, Controllers, Indicators, Transmitters, Valves and Analyzers. contact us now processcalibration@marshinst.com to get Marsh Calibration Services working for you! Marsh has skilled technicians to handle your complete range of Quality Approved Process Calibration needs.